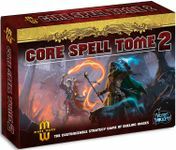 Mage Wars: Core Spell Tome 2 contains 110 cards that feature additional copies of the more powerful spells in the Mage Wars base game, including higher level spells and legendary creatures. Of the 110 cards, more than seventy spells are not found in the first Core Spell Tome. With this supplement, you have the ability to customize your Mage and explore various builds adding depth to your tactics and assault. You need the Mage Wars base game to use this expansion.